2Traditionally located as an educational tool, public debate is envisioned by most somewhere between nostalgia for a long lost era of robust public participation, and the televised debates that populate our election cycles. 3This essay intends to rework that sense of meaning and affirm a revolutionary notion of public debate. The chief value of this project is the moving of public debates from the position of public sphere and into the world of activism. It is important to recognize that this essay emerges from the practical work of an activist/academic and whose concerns are explicitly political. 4This essay will outline the current crisis of legitimation of the public sphere with careful attention to the specific context of public debate. Looking at the scene of persuasion in the public sphere, the first section of the paper will explore how media and corporate control circumvent vigorous dialogue through the example of Ulrieke Meinhof. Extending this notion to activism, this essay also explores how activist persuasion is limited in the current geostrategic political context. 5In the final section public debates are positioned as a method to create new public norms, engage activist causes, and spark vitally needed critical analysis within the American context. In this section a revolutionary methodology of public debates is outlined. 6We are accustomed to ignoring or discounting arguments by advocates. Humans selectively filter out messages based on their own experiences. Our ability to read through interpretive frames is a vital part of living in an information age. One part of the necessary living skill of linguistic interpretive defense is that bodies become commodified. As we solidify identity, we interpret our frames via that identity and close off ourselves to new meaning. A good example is the recounting of the tale of Ulrike Meinhof in the new Semiotext(e) book Hatred of Capitalism. 8Her escape was to break free from that old epistemology and constitute a new (more self-authentic) way of knowing the world was at the heart of her sudden transformation into an urban revolutionary. “Could Meinhof’s entry into ”armed struggle“ really be a war of language? Direct action as escape from the self-conscious claustrophobia of arrogant, objectifying discourse” (61-2). 9If we imagine these acts as spontaneous moves of resistance against a dictatorial epistemology, we earn the opportunity to explore how our own lives are constrained and how we might break free from these systems of meaning. Meinhof s reaction of armed rebellion in response to the strict limitations of her being is certainly extreme. But perhaps the problem that she indicated, the control of our frames of meaning, is pandemic. Meinhof was a captive subject of a mediated life and having been publicly constituted, her aversion to media portrayal made the emancipatory politics of Baader reasonable. Having been made dual through a media representation, Ulrieke Meinhof was keen to ignore media demons and without the shackles of media opinion, Meinhof s politics merged into Baaders. 10Perhaps we are all in a place like Ulrieke Meinhof. Victims of a mediated society whose metastasized norms are too alluring to turn down. Without the betrayal of the media, we have not been called to arms against the media as Meinhof was. And if this duality gave rise to her eventual emancipation, then we should consider how best to transform these meanings. Given the commodified nature of fame, it is best that we consider an alternative path to liberation. 11What brought the revolutionary politics of Baader to Meinhof was solid argumentation.3 All that need be cracked is the filter that prevents those ideas from getting in. Primary among those constraints is the media system. Here we can join Meinhof s challenge to the media system with the most articulate of the postmodern media critics, Jean Baudrillard. 12Baudrillard argues that mediated experiences are increasingly being created to be more enjoyable than reality – hyperreal in order to seduce us into disregarding the real. In The Gulf War Did Not Take Place, he describes a media machine so powerful as to create and sustain the means for war beyond personal experience. Baudrillard’s criticism about the media can mesh surprisingly well with scholar of the public sphere, Jurgen Habermas. 13Habermas argues that a primary downfall of the public sphere is that experts maintain, “a priori in what fashion the democratic state has to pursue” its goals (Public Sphere 435). In a world that necessitates critical facilities to interpret persuasive experiences, Habermas argues that we need new communication norms to get out of this experience, lending support lor Meinhof’s revolutionary turn. 14McCarthy position’s Habermas’ criticisms of the current state of public dialogue (legitimation crisis) “as the willingness to accede to a political order because it provides an acceptable flow of system conforming rewards” (377). Further he argues that the media is responsible for this phenomenon. And this is a deep corruption of the public sphere, which might otherwise create policies that directly benefit the oppressed. 17The public sphere, simultaneously predetermined and dominated by the mass media, developed into an arena infiltrated by power in which, by means of topic selection and topical contributions, a battle is fought not only over influence but over the control of communication flows that affect behavior while their strategic intentions are kept hidden as much as possible (Public Sphere 437). 18Michael Schudson takes this notion, that there was a public sphere, to task. He argues that there was no nostalgic time that we hearken back to. Schudson gathers voting rates and finds that the supposed golden age of American participation had devastatingly low participation rates. Even more intense, Schudson argues that the critical discourse of early citizens was circumvented by class and religious lines and that participation was so tied to party norms that “Politics, then, was more a communal ritual than an act of individual or group involvement in rational-critical discussion (159)”. Finally concluding that riots were a much more representative way to understand early American political participation. Schudson’s rational-historical research leaves us all the more confused about why the trope of an ideal public sphere emerged? 19Perhaps, like the movie The Matrix, we already live in a pre-constituted world of media symbols. Most prominent among these symbols is that there was a time of full participation and non-mediated experience. Complete with this fictitious notion that there once was a golden age of rational communication in sync with governance. If this is the case, then the illumination that need emerge to political agents is the transparent nature of the bubble around us. What is necessary is not that citizens be reinvigorated in their faith in democracy, but rather in the duplicitous nature of the state. 21For every ten dour activists whose methods overwhelm their message are the brilliant few activists whose capers slip past the mediated symbols by engaging with the media system itself. Foremost among them is Guy Debord and the situationists whose agitation and direct action cracked open the assumptions of hierarchy within a state. Also worthy of applause are the Canadian activists who publish the magazine Adbusters, whose challenge to the grease of capitalism is refreshing. Consider the sublime anarchist pie throwers, the Biotic Baking Brigade, whose targets have included Biotech guru Robert Shapiro and Bill Gates. There are options for readers who want to explore around mediated forms, but for those not turned onto anti-media criticism there is limited outreach potential even for these creative activists. 22Given the limited potential of media or protest norms to fundamentally challenge the media system and elicit vigorous public dialogue, we must seek another path. I propose public debate as an option that fulfills the revolutionary potential of each being to determine their destiny. 23This section of the paper outlines the reasons why public debate can break through traditional means of exclusion and empower critical thinking beyond the mediated experience. This process of liberated epistemology will be explored in this section. We will look at the meaning of public debate for the audience, the possibility for public debate to challenge conventional norms in the public debate process, and the prospects for radical change in public debate participants. 24Public debates are smaller than people think. A public debate has to be small enough for every audience member to feel empowered and a full part of the process. Public debate must provide opportunities for the audience to participate. If these things don’t happen then a debate is not actually public. It is this relationship with the public that solidifies the value of public debate. Habermas calls this an “equalization of power” (Moral Consciousness 71). Without this audience role, then the traditional norms of hierarchical experience will reassert themselves and we will lose any of the benefits of the project. 26When the public experiences the debate on their own terms, then possibility exists for real change. McCarthy argues “the subject’s needs find adequate interpretations in these structures” (352). Waldman explains that “the process of deliberation engenders a transformation among the participants”, which he describes as an increased political awareness. This process emerges only through meaningful dialogue that includes the audience in the dialogue. Giving a lecture on a stage only achieves one half of the two-way dialogue necessary. 27This personal involvement with a debate can create new meaning because the arguments presented in the debate operate in a non-mediated experience.7 They point to a new way of thinking (these emancipatory ideas may have been presented by an expert or a member of the audience) that elicits a sense of self-confidence. In the mediated society we are constantly told that we are not smart enough to draw our own conclusions and the voices of pundits must frame our issues. A thoughtful public debate encourages exactly the opposite relationship. The audience MUST draw their own conclusions in the face of two compelling advocates who are opposed to one another. In some ways, the audience is called upon to participate more fully. 29Critics may argue that this outcome of knowledge creation can result in audiences being manipulated and controlled. Of course, it is possible for someone to be swept up by a powerful advocate and participate in evil. This objection harkens back to the fear of rhetoric embodied in the criticisms of the sophists. The possibility of people to become persuaded by a dark power is always there, but I will argue that the process of public debate limits this risk. Cohen and Arato point out that the successes of social movements result in more self-reflective open dialogue. Social movements help to teach humans the “learning process” of critical public life. In the same way, the process of a public debate lends itself to a radical challenging of hierarchy. Senses of self-confidence in ones own opinions emerge and a sudden realization that one had been shackled to a cookie-cutter epistemology. Similarly, the nature of public debate creates a norm of dialogue that is fundamentally self-critical. The outcome of a public debate can only encourage dialogue and limit demagoguery. 30Intention on the part of the organizer of the public debate will also have a significant impact on the educational outcomes of the public debate. Is the subject matter relevant to the lived experiences of the audience? Is the forum in a place where people can get to see the event? Is there space for audience members to dialogue and clash with the experts? Is there space for the audience to establish spheres of engagement? All of these questions need to be explored en route to creation of a public debate. 31One question that needs to be asked is the role of audience knowledge in the public debate. It is vital that the lived knowledge of the public be given a space to emerge. Public debates encourage a resistance to top-down knowledge. Because of the built-in reaction period, the public debate experience guarantees the authentic response by the audience. Habermas points us in this direction in his book Moral Consciousness and Communicative Action. He writes that “[e]veryday life... is a more promising medium for regaining the lost unity of reason than are today’s expert cultures or yesteryears classical philosophy of reason” (18). It we enable community members to express their own experiences in the space of a public debate, then the possibility for real change emerges. Girded by personal experience, the shallow nature of mediated control becomes obvious and the resistant strains of public thought emerge as reasonable alternatives. Citizens’ engaging with other citizens to challenge experts is a possible outcome for public debates. 32Public debate is a powerful agent of social change in part because it encourages new voices, but it also exposes bad arguments to public scrutiny. Waldman argues that “political conversation” has the opportunity to “exposes one to facts and arguments about the interests of others and the larger community to which one might not have had access previously” (153). Envisioning public debates as information clearinghouses can help to point us to the kinds of public debates and events that we can host. 34Public debates challenge commodity culture. They exist outside of the realm of ideas for purchase because the event is driven by intellectual development, not profit. Public debate disarms the increasingly partisan audience. The event is balanced at the beginning. The partisan nature of the audience is transformed into a potent challenge on behalf of a larger public. Even decidedly partisan folks bring a criticism on behalf of the “other”, another universalized being. The competitive nature (certainly not necessary) of public debates means that we can escape corporate rule through cooperation. Even in the face of a clash between life-long opponents, members of the audience can cooperate. In these brief spaces of non-mediated autonomy, cracks in our solid framework begin to emerge. 36This move of course, is not revolutionary because we come back to solidify a notion of the public sphere, which in turn props up the notion of a democratic state. But if we reposition this engagement as safe space for activist intervention, then we can come up with a more radical interpretation. To do this, I want to turn to Nancy Fraser and Antonio Gramsci. 37Fraser argues that Habermas fails to comprehend the exclusionary nature of public spheres in the past. I would argue that public debates have the opportunity to circumvent traditional pathways of exclusion that are compellingly explicated in Fraser’s book Justus Interruptus. This is not to argue that public debates are completely open, but rather that they are more open for engagement than traditional public sphere focus. Keep in mind that Habermas, Barber, and Calhoun all position the public sphere as emerging within a bourgeoisie culture of private clubs.11 Fraser writes that “subordinated social groups usually lack equal access to the material means of equal participation” (79). This is not the case with public debates. In fact, well-planned public debates can be a powerful opportunity for activist groups to bring their ideas to a larger public. Most importantly, they can persuade in a space without direct media interpretation. This allows their messages that would otherwise be undercut or silenced to emerge into the public. 39Fraser’s arguments help us understand the value of public debates. Antonio Gramsci’s ideas about the Organic Intellectuals can help us to position academics and their roles to play. Gramsci argues that the state maintains control over populations because they can simultaneously threaten citizens if they step out of line and the state gives minute reforms to encourage citizens to believe in the state. Against the forces of the state, Gramsci positions Organic Intellectuals as individuals who help to coordinate and express the desires of the oppressed against the state. Gramsci imagines intellectuals who retain connections with an oppressed populace and who become “permanent persuaders”, pushing the knowledge frames of the oppressed against the knowledge frames of the state. 40I think that Gramsi and Fraser can help point us to a role for academics who are considering public debates. Our role as intellectuals is to engage with the political at the highest level of meaning. To do this, we need to consider how our privileged positions in the academy can help to enhance social movement meaning. Public debates circumvent the media deadlock, opening up spaces for individuals to be moved by activist messages. Like Meinhof, individuals can have the opportunity to explore epistemologies outside of their current frames. This opportunity represents the highest level of activism and intellectual exploration, that of the revolutionary. 41This essay positions public debate within its revolutionary potential. Public debate provides an opportunity to get around the traditional mediated experience of public dialogue. After exploring the damage that media systems do to authentic political dialogue, public debates are positioned as windows of opportunity for radical personal change. By coupling social movements with public debate opportunities, Organic Intellectuals can help crack open the traditional top-down method of knowledge, and open the space for individuals to define their own politics. This opportunity may not be taken, but the possibility for change can not be overstated. Through engagement with meaningful dialogue and experience, critical citizens emerge who are willing to take epistemological risks. Some of those risks might create actions like Meinhof – and emerge as revolutionary icons. Barber B. , Jihad Vs. McWorld, New York, Ballentine Books. Baudrillard J. , The Gulf War Did Not Take Place, Bloomington IN, Indiana University Press. Baudrillard J. , Simulations and Simulacrum, Ann Arbor MI: University of Michigan Press. Cohen J., Arato A. , Civil Society and Political Theory, Cambridge MA, The MIT Press. Crimp D., Rolston A. , AIDSDEMOGRAPHICS, Seattle, Bay Press. Deleuze F., Guattari. , “May ’68 did not take place”, in Hatred of Capitalism (Eds. Kraus and Lotringer), New York, Semiotext(e): p. 209-211. Difranco. A. , “My IQ” Puddle Dive, Righteous Babe Records, Compact Disc. Eyerman R., Jamison. A. , Social Movements: A Cognitive Approach, University Park PA, The Pennsylvania State University Press. Fraser Ν. , Justus Interruptus: Critical Reflections on the “Postsocialis” Condition, New York, Routledge. Foss S. K., Foss Karen Α., Trapp. R. , Contemporary Perspectives on Rhetoric, Prospect Heights IL, Waveland Press, Inc.
Gramsci A. , The Prison Notebooks, New York, International Publishers Co.
Habermas J. , “Further Reflections on the Public Sphere”, Habermas and the Public Sphere (Ed. Calhoun), Cambridge MA, The MIT Press: p. 421-461. Habermas J. , Moral Consciousness and Communicative Action (Trans. Lenhardt and Nicholsen), Cambridge MA, The MIT Press. Keenan A. , “The Twighlight of the Political? A Contribution to the Democratic Critique of Cynicism”, Theory and Event. Kraus C. , “Aliens and Anorexia”, Hatred of Capitalism. (Eds. Kraus and Lotringer), New York, Semiotext(e): p. 57-62. Mccarthy T. , The Critical Theory of Jurgen Habermas, Cambridge MA, The MIT Press. Mcgee M. C. , “Social Movement: Phenomenon or Meaning?”, Central States Speech Journal, n° 31: p. 233-244. Meinhof U. , “Armed Anti-Imperial Struggle”, Hatred of Capitalism. (Eds. Kraus and Lotringer), New York, Semiotext(e): p. 63. Mitchell G. , “Pedagogical Possibilities for Argumentative Agency in Academic Debate”, Argumentation and Advocacy: p. 1-15. Mitchell G. [May 10, 2003], Telephone Interview. Schnurer M., Snider A. C. , Many Sides: Debate Across the Curriculum, New York, Idea Press. Schnurer R. M. , Towards A Semiotics of Freedom, New Paltz, New York, KMEME Media. Schudson M. , “Was There Ever a Public Sphere? If So, When? Reflections on the American Case”, Habermas and the Public Sphere. (Ed. Calhoun), Cambridge MA, MIT Press: p. 143-163. Waldman P. , Deliberation in Practice: Connecting Theory to the Lives of Citizens, Politics, Discourse, and American Society. (Eds Hart and Sparrow), Lanham MD: Rowman & Littlefield Publishers Inc: p. 151-171. Wallen J. , “Reading Spaces: The Poverty of Conversation”, The Yale Journal of Criticism, 9.2: p. 405-419. Wetherell M., Potter J. , Mapping the Language of Racism: Discourse and the Legitiation of Exploitation, New York, Columbia University Press. 1 In this essay, when I refer to public debates I am indicating a relatively a unique phenomenon. In the United States among competitive University debating teams, there is an increasing interest in debates that are put on with the specific intention of a public audience. Debate scholars like Gordon Mitchell at the University of Pittsburgh, Alfred Snider at the University of Vermont, and John Meany at the Claremont Colleges have all promoted the use of public debates as a way to encourage civic dialogue and conversation about important public controversies. The public debate stream in the United States generally consists of several experts and students clashing in a public forum with a significant portion of the event set aside for public comment. 2 Meinhof had been working with troubled girls at a local reformatory school. Kraus hypothesizes that the lived nature of the young girls that Meinhof came to encounter created a new sense of meaning about the world. And it was this disconnect between her politics and her life that resulted in her revolutionary turn. 3 Interesting to note that Meinhof’s communiqué drips with simple prose as a rebuttal to her overly academic past. Reality can only be perceived in a materialism related to struggle – class straggle – and war. Revolutionary action – no matter how it is brought about – will always be understood by the masses. Words are senseless, outrage is no weapon ; the Guerilla takes action. 4 There is room to criticize this essay for nostalgia. Although a position where one is liberated from media experience is central to this argument, there is a nod to an ideal world. 5 For more on the frustrating nature of commodified activist politics see Schnurer’s essay Toward a Semiotics of Freedom. This essay outlines the difficulties that activists face in cultivating an earnest political norm among media-savvy consumers. 6 For more on this see Gordon Mitchell’s essay. He outlines some of the emancipatory moves that have connected public debates to the activist turn. 7 For this reason, re-broadcast public debates on the Internet, or on video formats does not contain the revolutionary potential that experiencing the event of a debate in real time can have. 8 Eyerman and Jamison point to a vigorous notion of public intellectuals. They suggest that one of the most powerful functions of a social movement is to encourage knowledge formation on the part of the public and to encourage those publics to clash with established « experts ». A good example of this would be the American AIDS activist organization ACTUP, whose members became such experts on the epidemiology of HIV, that they were eventually invited to sit on Food and Drug Administration panels. For more on this see Crimp and Rolston. 9 A good example of this occurred in Pittsburgh in 1999. I was involved in both the public debate program at the University of Pittsburgh and the campus animal rights group. The animal rights group prepared a 3-day demonstration against animal experimentation (vivisection) on the campus, and had dozens of events ranging from speakers to movies. The highlight of the event was a public debate between prominent anti-vivisectionist MD, Ray Greek. Independent of the activist group, the public debate program agreed to broker a public debate on animal experimentation. The public debate program at Pittsburgh invited more than 20 research scientists to participate. All of them turned the offer down, several expressing that they wanted to come debate, but that their department chair had suggested that they boycott the event. These research scientists knew that the full weight of public scrutiny would dangerously undercut their own expertise and so they refused to participate. 10 Pushing this notion of rhetorical transformation encouraging epistemological shift, Wetherell and Potter contribute a significant study. Their exploration of the racist rhetoric of New Zealand brings a specific instance to light using Foucault’s discursive analysis. 11 These private clubs center on exclusion. Although they are the birthplaces of American civic culture, they are also most often the centers of reactionary politics. In America, the idealized civic spaces of community organizations, are often right-wing organizations whose political vision does not include women, queers, the earth, or and dissident opinion. 12 In an interview with Gordon Mitchell, I asked him about the likelihood of public debate becoming a social movement in the United States. He replied that the various activists who are promoting public debate in the United States are all coming from very different places, and their methodologies are dramatically diverse. Rather he suggested that we use Michael McGee’s notion of social movements as meaning rather than phenomenon to help understand the public debate movement in the United States. Mitchell suggests that the varied telos of public debate advocates may mesh into some level of shared meaning. SCHNURER, Maxwell. 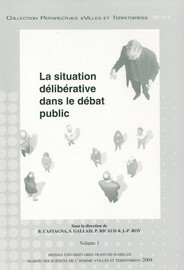 Participation to Praxis: Public Debate as Amplification of Civic Culture In : La situation délibérative dans le débat public : Volume 1 et 2 [en ligne]. Tours : Presses universitaires François-Rabelais, 2004 (généré le 25 avril 2019). Disponible sur Internet : <http://books.openedition.org/pufr/7126>. ISBN : 9782869065000. DOI : 10.4000/books.pufr.7126. Schnurer, Maxwell. “Participation to Praxis: Public Debate as Amplification of Civic Culture”. Castagna, Bernard, et al.. La situation délibérative dans le débat public : Volume 1 et 2. Tours : Presses universitaires François-Rabelais, 2004. (pp. 95-107 -Vol. 1) Web. <http://books.openedition.org/pufr/7126>.